When working from home, I like to wear comfortable clothing with stretch but things that can easily look put together when I leave the house. 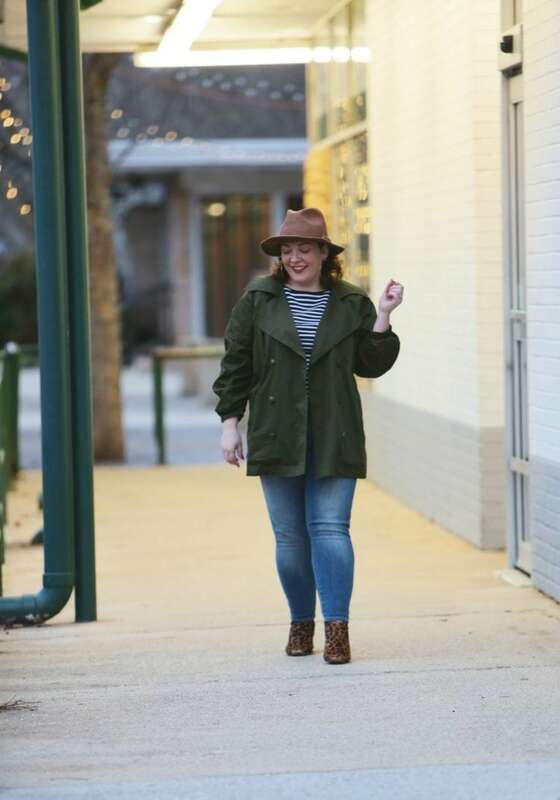 Jackets are a perfect way to make separates feel like an outfit but they don't always have to be a blazer. 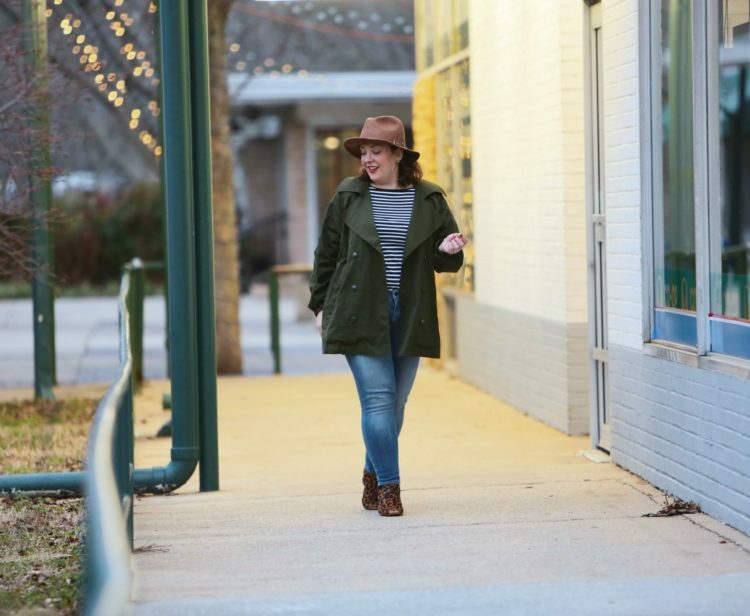 I recently received the Expedition Jacket from cabi and love how I can throw it on over skinny jeans or leggings and look boho casual yet more pulled together than if I threw on an old cardigan or hoodie. 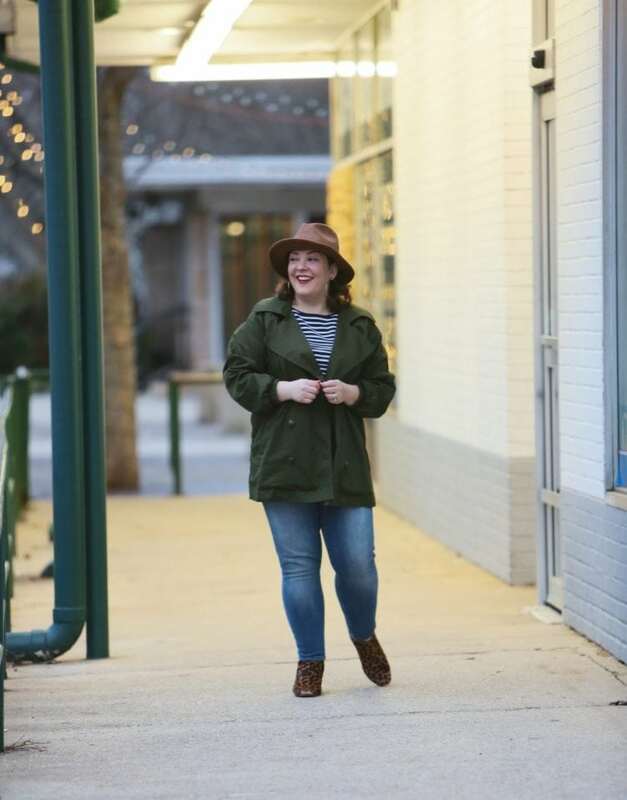 I'm not a utility jacket kind of gal; I've bought many over the years but I never feel myself in them. This one I like because it's not utilitarian at all, the only similarity is the color and fabric. 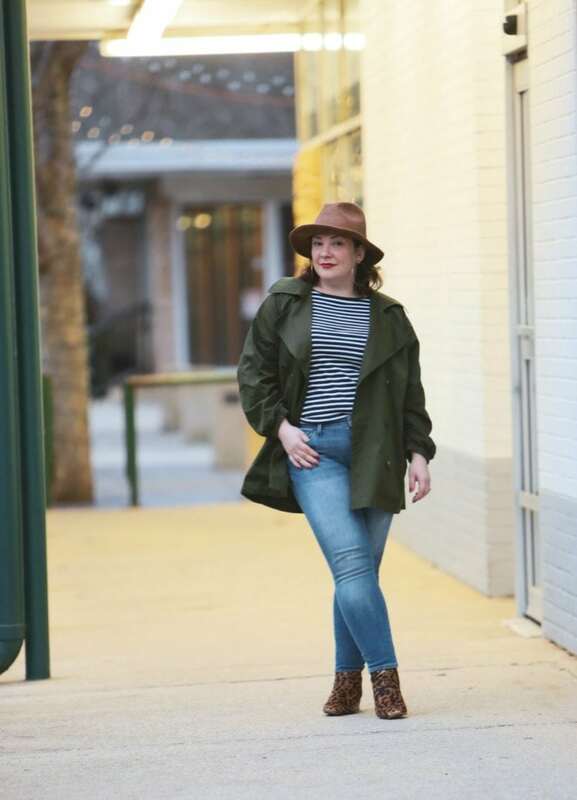 cabi has the jacket styled with a belt cinching it and I've found I also like that effect… I'll likely try it that way this spring with white jeans. But for a rainy yet not cold day I felt it was perfect to throw over stretchy jeans and a striped tee. This is the kind of outfit I wear on weekends, when running errands, when being a mom. Stretch, comfort, staples, machine washability. I add accessories to put an “Allie” spin on it and make it look purposeful, My go-tos are red lips, great earrings (did you see Serena Williams wear these very same earrings in a Superbowl ad for Bumble? ), something leopard printed, and a hat if it's not a great hair day. One problem with my body shape changing with lifting weights is that most of my striped tees no longer fit. While I'm a fan of tailoring, most of my striped shirts are so well-worn they don't really deserve alterations. 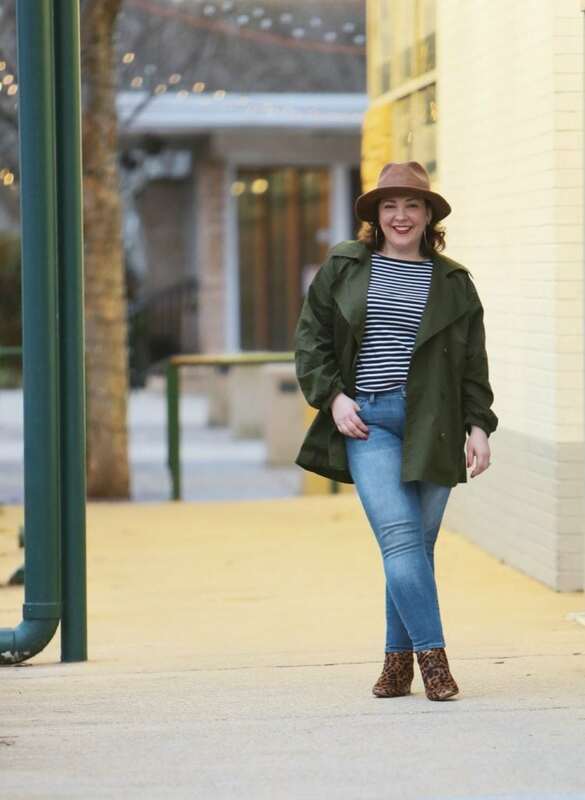 Talbots sent me their Spring 2019 Look Book and I saw this striped shirt and knew it would be a great replacement for my closet. It's not as boxy as my old striped tees from J. Crew, but is the same weight which I love. I also got this scarf and was envisioning wearing them together with the pink trench coat from Tuesday. 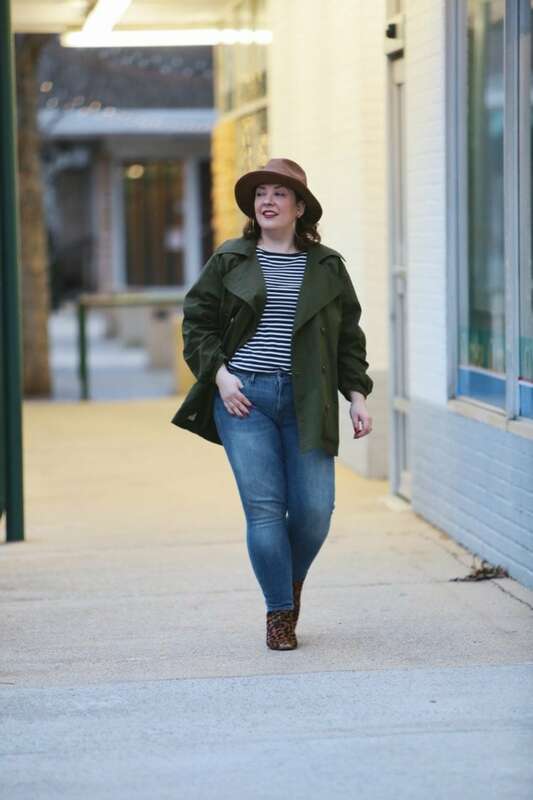 And these jeans… you have seen them on the blog a LOT. I've had them for almost two years (think this is the first time they were on the blog) and they haven't aged well. They have gotten lighter in color and thinner and I think other jeans are kinder to my body. But they are amazing in how they're super stretchy, don't stretch out, are incredibly comfortable, and have a good rise and leg length right out of the box. My denim review from Monday is really looking for a replacement for these jeans because I keep reaching for them and I never fully like the effect. As for the hat… real talk. I worked this morning in the striped tee and jeans but had an early afternoon hair appointment. I didn't see the point in washing and styling my hair to go there and get it washed and styled again so I threw on this hat. Later in the day when we went to get some errands done it was drizzling so I put the hat back on to stay dry. This hat is leather and like my leopard booties I think the more beat up it gets the more character it has. 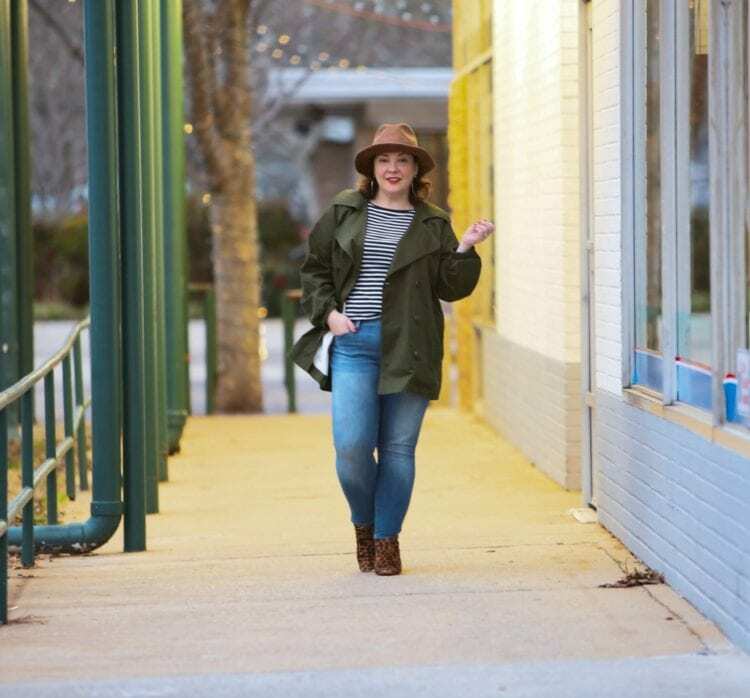 I love the cabi Expedition Jacket. It looks great on you. I love how jackets can elevate any look. 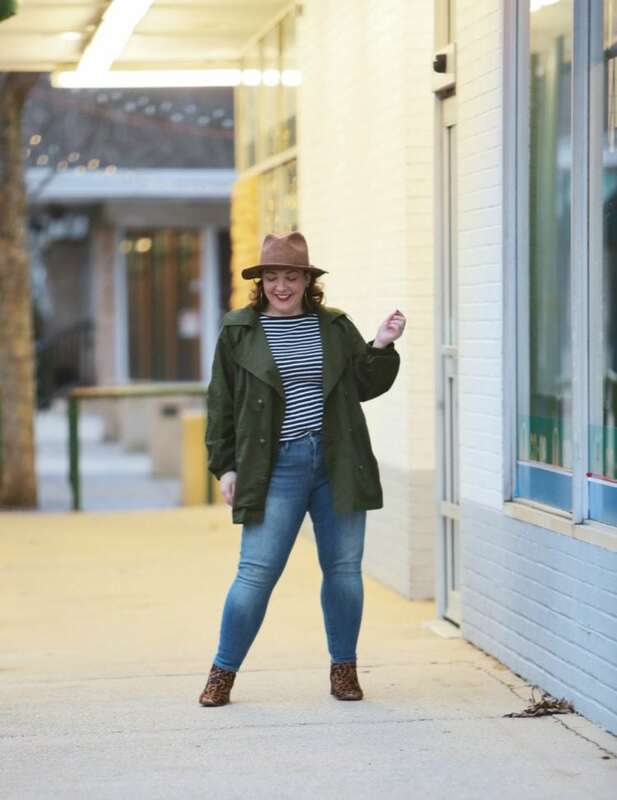 Do you feel the fit is supposed to be over sized, and therefore, I should stick to my regular cabi size? It is supposed to be oversized, but it’s not oversized in the shoulders and arms. I *may* have been able to get away with sizing down but fear it would have been too tight in the arms. However if you’re between sizes I’d size down.